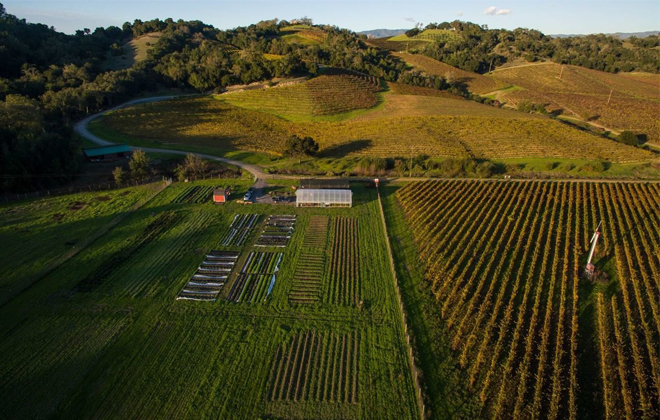 How about a little getaway from these cold New York days for a weekend in the paradise of Sonoma Valley’s very own SingleThread Farm? Buckle your seatbelt, this is going to be quite a getaway. Hailed as one of the most anticipated restaurant openings of 2016, SingleThread Farm is not just an amazing farm-to-table, fine dining experience. With a beautifully restored guest house and completely functional farm including orchards, greenhouses, and rooftop gardens, it truly is an immersive experience! SingleThread Farm is the work of Kyle and Katina Connaughton, who having been high school sweethearts, have been together for over 20 years. Although this marks their first business endeavor together, marrying her experience and love of farming, and his experience and love of cooking – all with a flair for Japanese culture and expression, while pulling from the heart and soul of the Sonoma land. Chef Kyle Connaughton has worked in top ranked kitchens in England and Japan, while Katina, with the help of her brother, manages the delicate ecosystem of the farm. In this way, the restaurant is always taking direct inspiration for the menu from whatever is in season on the farm. And it truly is a family affair, with the greater team made up of “farmers, chef’s, foragers, and artisans” bringing together the complete holistic experience of staying, eating and farming. Offerings from the SingleThread restaurant almost look like they are finely crafted pieces of art! This farm to table operation is in part a way to fulfill both sides of the couple’s passions, but also demonstrates a commitment to sustainability. 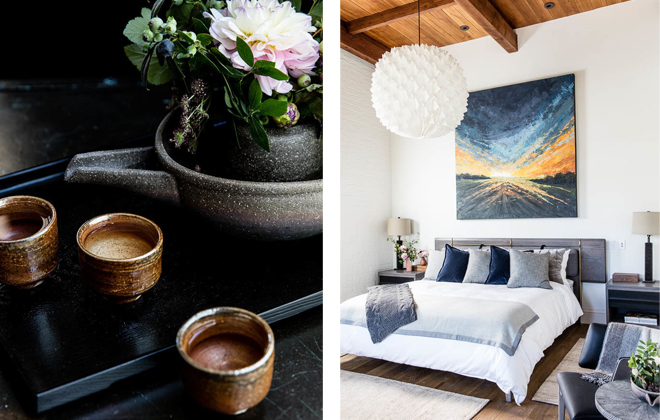 At the farm they work with many craftspeople locally and abroad to produce their wares, so not only is the food local (like backyard local), but the cutlery, ceramics, and furniture is handcrafted and sustainably sourced as well. Like the earthenware pots, dishware, and serving vessels that are made by the Nagatani Family of Iga, Japan, who are 8th generation master potters. I told you this was going to be good. Feel like room service? This amazing meal could arrive at your door. I just love the dishware, all slightly different, but so beautiful all together. This brings us to the restaurant itself, and does it sound amazing! Set in the farmhouse, the open style kitchen really does feel like a home, which combined with the limited seating makes dining here feel like you’re at a fabulous dinner party. The seasonal eleven course meals can be tailored with wine pairings, and to fit guests dietary restrictions. 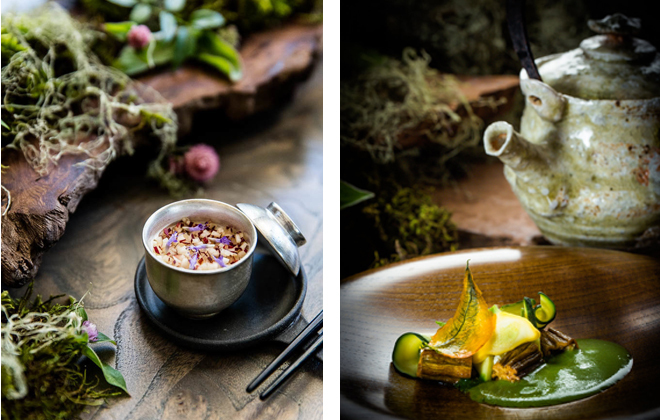 The ethos behind the meal is based on Japanese Kaiseki, which means the menu is never the same, but always unique to the moment. This idea works perfectly with the farm ethos as well, given that there is always something new and unique growing at any given moment. I just love the idea that you could go back multiple times, and always have a completely unique experience, from the meal to your stay. The warm, intimate interiors of the SingleThread restaurant. And when it comes to the guest rooms, no detail is left undone. 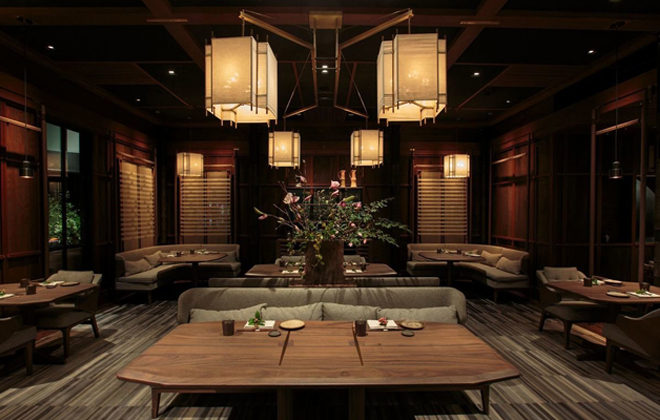 The duo enlisted the help of LA based design firm AvroKO to incorporate the earthen quality of the land with the Japanese simplicity of style, making the experience as thoughtful as the meticulously prepared meal itself. There are only five guest rooms, but each one is beautifully decorated to feel timeless yet contemporary, luxurious yet simply elegant. 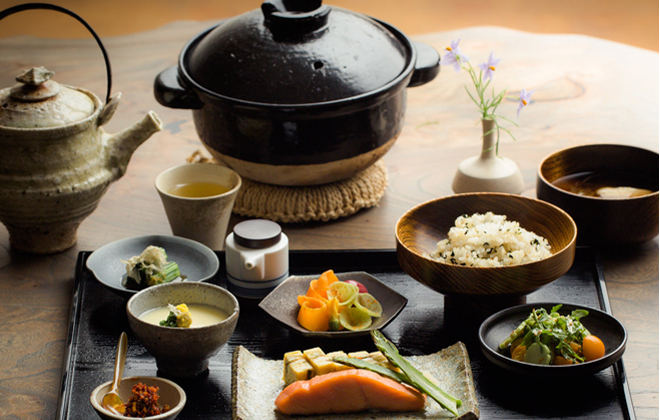 The hospitality also pulls from Japanese tradition, anticipating the guest’s every need, while also catering from the farm itself, offering snacks, teas, and dress pressed juices all made from the land. Left we have in-room tea, and right we have the cozy, bright interiors of the guest rooms. 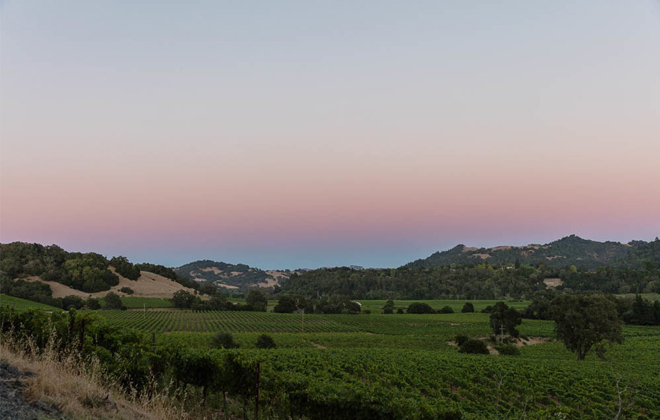 Now that’s what I call a Sonoma Sunset. This truly does seem like an amazing experience, heightened by the fact that the restaurant and guest house is small, meaning you must book two months in advance for dinner! But it feels worth the wait, a truly immersive farm-to-table experience like none other in the region. Who wants to join me?